This cancer is absolutely the weirdest thing for me. For those of you who know me and my life, saying anything is the weirdest is definitely saying something. Like most people, I’ve experienced my share of illnesses, losses, and tragedies. In those cases, there occasionally were moments, usually late at night upon awakening, in which I would ask myself, Is this a dream? There have also been those moments in which I “forgot” reality for a brief period before everything came crashing back. Cancer for me is nothing like either of those experiences. Not for one single moment, not ever, have I been unaware that there is something in my body that shouldn’t be here, that chemotherapy drugs are at work killing what wants to destroy me, that the physical side effects and symptoms have a definite cause that can’t go away yet, and that inside my body a battle is raging. I think of my cancer as if my lungs are wearing a huge furry coat with a thick furry lining covering every cell and atom in and on and through my lungs and bronchial tubes and lymph nodes. While reading those words might make you think, oh no, honestly it’s not something that strikes fear in my soul (prayer at work, of course). This is my experience right now, and I work to keep myself focused on right now. I try not to think of what’s going on inside, but I can’t ignore the fact that something is happening. I imagine my experience is similar to others who have had a serious diagnosis, but I also realize that everyone’s experience is different. I’m not trying to make some broad generalization here or to say that I have particular insight into “cancer.” Trust me, I don’t. Random side note: Whenever I have to call the oncology office because of some ailment after treatment, the nurse at some point will ask me, “Are you in distress?” I have to answer honestly that I’m not. I may be uncomfortable or bothered or achy, but I’m not in distress. Since people who know me know how I love words, they won’t be surprised to know that I looked up the definition of distress and discovered it means “extreme anxiety, sorrow, or pain.” It’s derived from French with a Latin origin meaning “stretched apart.” Distressed…stretched apart., now that’s a great word, and I’m going to use it as a checkpoint for my state of mind: I don’t want to act or think I’m “distressed” when I am really just annoyed or irritated or frustrated. I’ll save distress for true distress. Anyway, back to the weirdness of my experience. I think that what has been amazing to me since February 17 has been the intentional interaction I have had with so many people. Students catch my eye as I walk down the hall, or they write a note. People blow the horn and wave in the parking lot. I hear, “We’re praying!” all the time. Friends (and people who think they are acquaintances and don’t realize that they are friends) nod or smile or text or email or write. Interactions may be brief, but every single one is powerful. Every point of contact reminds me that while this cancer is real and destructive, God is also real and definitely not destructive. He is providing for all of my needs before I even recognize that I have needs. He anticipates when I’ll be feeling sorry for myself, when I’ll need a laugh, when I need reminding that I’m not alone. He uses friends and strangers and acquaintances and friends of friends to remind me of His presence, and in the quiet of my soul He speaks to me and tells me that nothing else—nothing weird, nothing at all—matters because He is right here right now. I HATE writing about myself. I also don’t want to give a false picture—this is hard but God is SO much bigger. In truth, my picture of God has radically changed because of this. I honestly don’t think about how this will end because I know that God is in charge of the beginning, the middle, and the end. For me this experience gives me the truth of who He is, and I honestly wouldn’t change the experience because of the deepening view I’ve had of God and of myself. He is able to do immeasurably more that anything and everything I can imagine—and I believe that includes the weird. To Him be the glory for ever and ever. Trying to keep everything inside and in place. Thought I’d try distraction. Computer is dead. iPad is almost dead. Phone okay so I’m trying this. Excuse the errors. Maybe if I remind myself of sweet moments, I can rest. The Middle School Academy Dancers dedicated a beautiful lyrical dance to me at the spring performance. The piece was “Fragile” and I cried because they were so talented and compassionate. I’ll post a picture next time. Emily comes home today after a month in New York. Abigail’s face lights up when she says, “I love you.” Sarah James and Jacob are such great parents. Amber had an incredible 2nd semester at Tennessee Tech. I have a loving and supportive family and community of friends. I have been blessed by the students in my classes and in my school and by so many I’ve known through the years. I spent time this week with a good friend from the class of ’81. James takes such good care of me. I feel the power of prayer. I know that I am not alone. In the quiet of the night for the past two hours, things are settling inside. One more reminder that His grace is made perfect in my weakness and is sufficient–enough–for me. My life is bounded and measured in moments right now. It’s enough. Wednesday, May 16, is my third chemotherapy day. The last cycle was fraught with interesting side effects the first 10 days and a resurgence of familiar cancer symptoms added to the mix for the last 10 days. I’ve been very aware of the cancer and the chemo; there hasn’t really been a great day, but at the same time there hasn’t been an awful one either. I’ve heard that the experience is cumulative and that side effects can be a bit more intense with each new treatment. From my experience with just two treatments, I’d say that’s true. Yes, it’s been interesting. I’ve been able to be at school every day, which is incredibly affirming for me because students are so honest. They tell me that they are praying for me, and some leave me notes (a few anonymously). Then they move on with their lives, which is wonderful actually, because it reminds me not to wallow in my own situation. In the last three weeks, I’ve seen more people too, and I’m often asked, “What can I do? Of course, we are praying for you, but what else can I do.” So what do I need? Honestly, what I need is the same thing we all need—prayer. Prayer gets me up in the morning. Prayer allows me to make it through each day, to stay focused on my students and the lesson plan. Prayer helps the side effects and symptoms not overwhelm my life. Prayer focuses my energy on the next right thing to do, and often that means I go to bed early or simply rest. Prayer keeps worry, stress, and fear away. Prayer makes breathing possible when I am struggling to pull air into my lungs. I have never been more conscious of the fruitfulness and the power of prayer than I have since February 17. I haven’t been able to answer notes and emails, to respond to the many who have provided meals and flowers and treasures, or to move beyond the moment. I don’t know who is praying for me, but I feel every utterance in the fact that I can face each moment as it comes. Every second of my life right now is a testimony of the power of prayer. My greatest needs—even the ones I do not realize I have—are met through the prayers of those whom God has called to pray for me. I have been humbled by this in ways I cannot express. If you see me and wonder how I am handling things, know that your prayers are the reason you see me at all. On my own, I’d be unable to leave my bed. As I approach the end of a school year and a summer filled with three more treatments, I know that I will miss seeing people, so feel free to contact me at cindy_tripp@brentwoodacademy.com if you want. There may be times when it would be nice to sit and chat and not have to think about things. Oh, I thought perhaps someone might enjoy this picture taken this week. 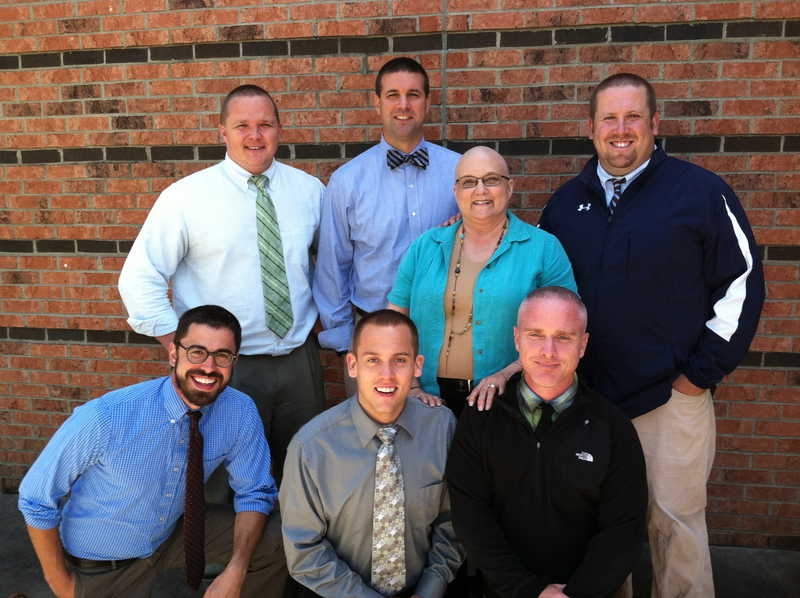 Six of my colleagues buzzed their heads to join me in my new hair style. The least I could do, I decided, was to remove my ever-present scarf and show my completely bald head too. Even buzzed, all of these guys have more hair that I do, but they do not have any stylish scarves or at least so far they haven’t worn one. I am so grateful for prayers, and I freely acknowledge that this is absolutely what I need. May the Lord continue to hold us tightly in His hands as we trust Him in all things. I have a confession. There are parts of this experience that I do not like. I don’t like the uncertainty of how I will feel in the next five minutes. I am frustrated that I am no longer dependable or focused or engaged or reliable or imaginative or thorough or sensitive or responsible. I wish that I could make plans to go somewhere or do something or at times simply finish some task. I don’t like having to say entirely too often that I haven’t gotten to that task yet, especially when the task is important and urgent. I’ve stopped making to-do lists because the ones I make are growing too long and yet are still incomplete. I recognize the times when I am grumpy and unreasonable and difficult and complaining, but I can’t seem to stop being that way. Oh, I’m handling the side effects as they come. I do rest and take care of my health. I am definitely not overdoing anything, not because I am good at doing so but because I have no other choice. I’m okay with the hair loss and the scarves. My white cell counts are fine, so I am not taking risks with infection. I don’t think that I’m discouraged or depressed, and I am absolutely certain that I am safe and secure in the hands of God. Nothing can happen to me apart from Him. I am encouraged when students and friends stop me in the hall to ask how I am doing today. I appreciate the unsolicited help that I get from familiar staff and from strangers in grocery stores and shops. I treasure the notes and texts and comments that remind me that I am not alone and that I am loved. I guess that I just miss the loss of what I thought were some essential pieces of me—those parts of my personality and nature—that aren’t true right now. Oh, I’m sure that this is temporary, but at some level I realize that this experience has forever changed me. The person who emerges through this process will be different, and that’s to be expected. I hope that I like the person that I’ll be after this. Actually, I hope that I can like the person that I am through this. On some level, I also know that this too is part of life. As I type this, however, I am reminded of Paul’s words in 2 Corinthians: “Therefore we do not lose heart. Though outwardly we are wasting away, yet inwardly we are being renewed day by day. For our light and momentary troubles are achieving for us an eternal glory that far outweighs them all. So we fix our eyes not on what is seen, but on what is unseen, since what is seen is temporary, but what is unseen is eternal” (2 Corinthians 4:16-18). What I am experiencing right now, both emotionally and physically, is no different from what everyone else experiences. My struggle is with cancer; your struggle is with something just as challenging to you. It’s about fixing our eyes on what we cannot see and not losing heart, about knowing that an eternal glory outweighs our light and momentary troubles, and about trusting that we are being renewed day by day. You know, I just counted the I-me-my words in this post so far: there are 57 and surely some were missed. (By the way, please don’t let me know I miscounted; of course, I messed up on this because that’s my life right now. Oh, did I mention I was grumpy?) In spiritual terms, confession is to acknowledge faults or errors, to agree with God about sin. Then confession moves us forward in confidence that the unseen is eternal, and it’s not filled with I-me-my words. My mother always told me that confession is good for the soul. She was right. Confession is good for my soul right now and in what lies ahead. I will fix my eyes on the unseen—on Him—today.